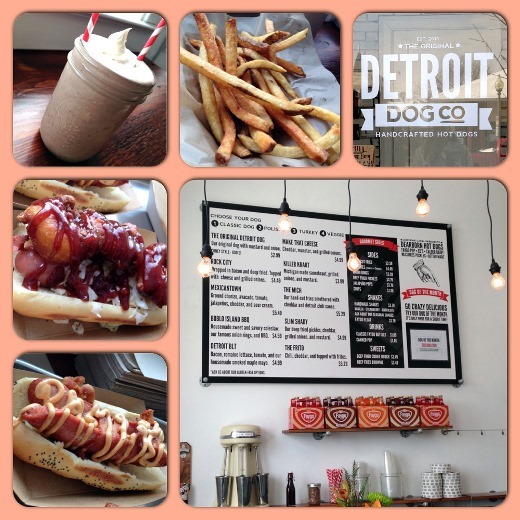 As promised in my recent birthday weekend recap post, I’m here to share my experience at a relatively new, local hot dog joint – Detroit Dog Co., located in downtown Saline, Michigan. I visited on a recent Saturday for an early lunch. The space is small but it has been utilized well. 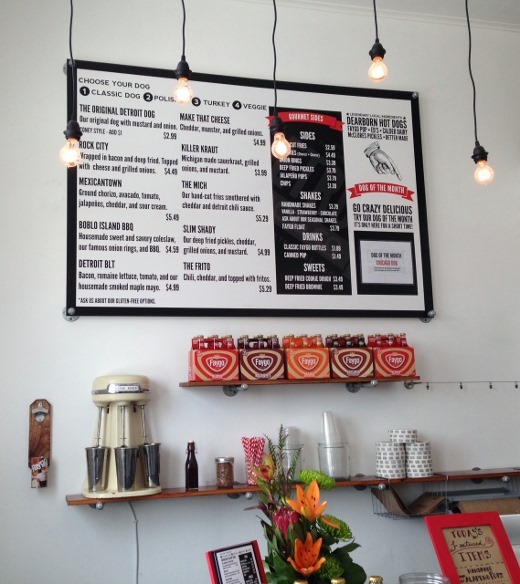 The staff were friendly and walked us through the menu, which consists of a number of specialty gourmet hot dogs, fried sides, and shakes. 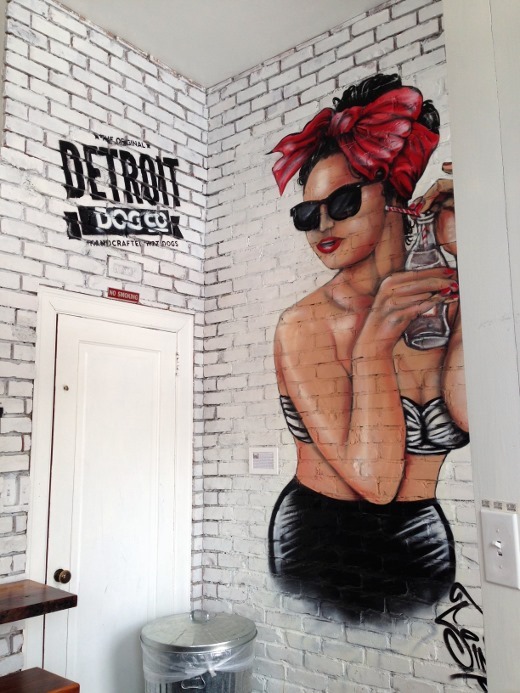 Tons of Michigan-sourced items are featured throughout the menu, which I love – Dearborn Hot Dogs, McClure’s Pickles, Faygo pop, Calder Dairy, Better Made Chips, and more. We shared a chocolate peanut milkshake. Though these super cute striped straws were included with our shake, I’m glad that we were warned that we would likely do better with spoons for this particular milk shake, due to the peanut chunks in the shake. 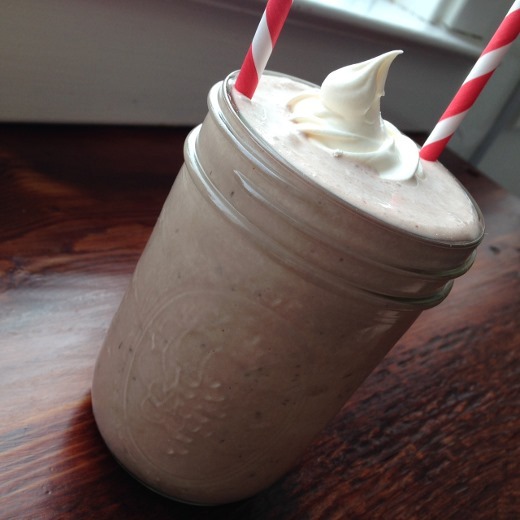 The shake was pretty good but it did not wow me – the consistency just wasn’t as thick as I’d prefer, but the flavor was pretty good. I think next time I’ll try out the fried cookie dough bites instead! Our shake was brought out first and we shared sips while awaiting our food, which only took 10 or so minutes to prepare. I loved how hot and fresh everything was. 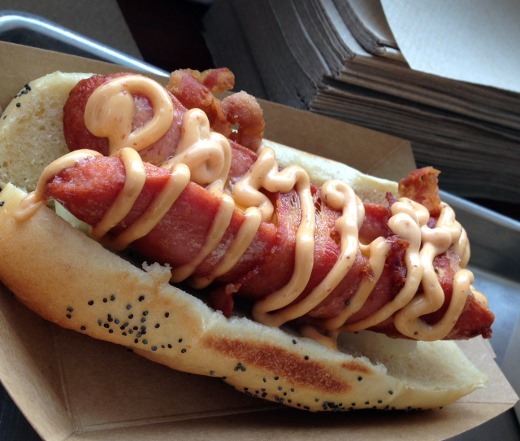 First up, I tried the Rock City Dog, wrapped in bacon and deep-fried, with bacon and grilled onion. 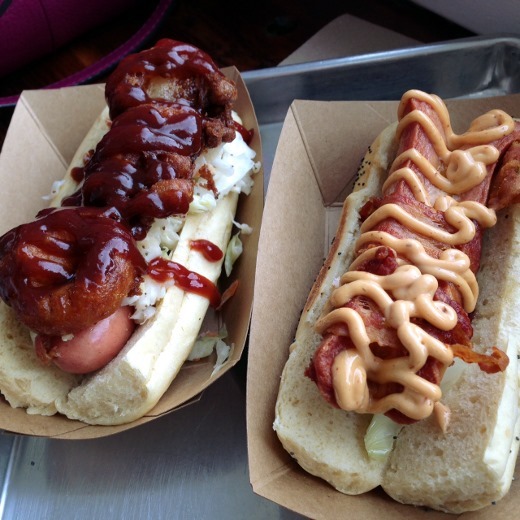 The Boblo Island Dog was also very tasty but unfortunately quite messy and difficult to eat. 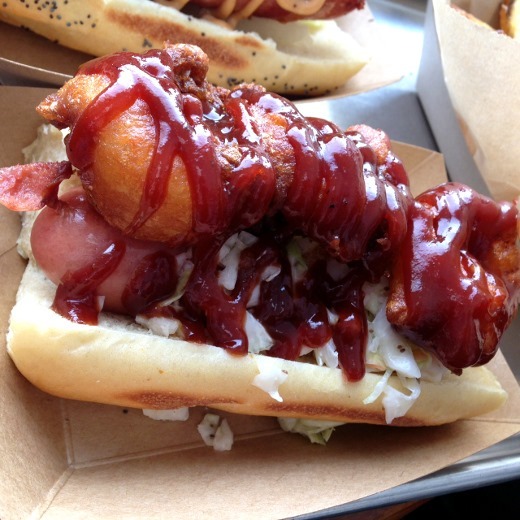 All of the dog elements – housemade slaw, onion rings, BBQ sauce, and the hot dog – were very good on their own, but I had to take the onion rings off the dog, preventing me from trying all the flavors together. I like the idea of this flavor combination, but I think that an easier-to-eat solution is needed. 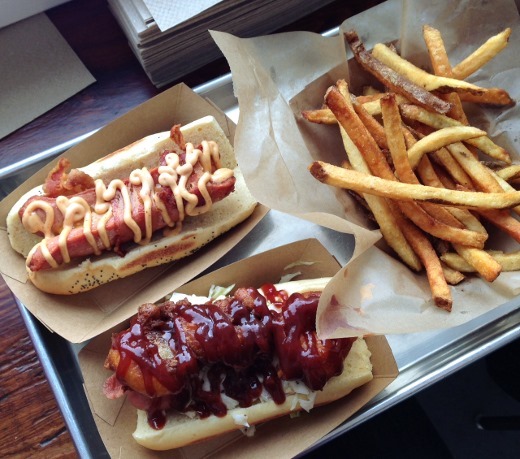 Onion straws beneath the hot dog, perhaps? Wrap the dog in onion rings? ..Knife and fork? I LOVED the fries! 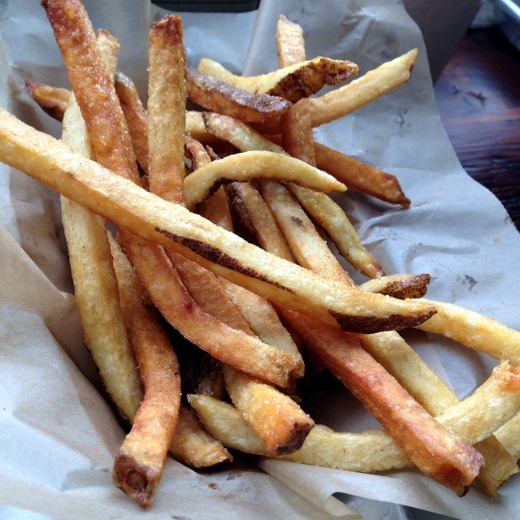 Now I know many people are particular about their fries, wanting just the right size and amount of doneness, crispiness, and salt, but it’s like these fries were just for me. Fairly crispy on the exterior but soft inside, very well-seasoned (read: salty, but not overly), HOT, and cooked to perfection. I dipped a few in the milkshake too. 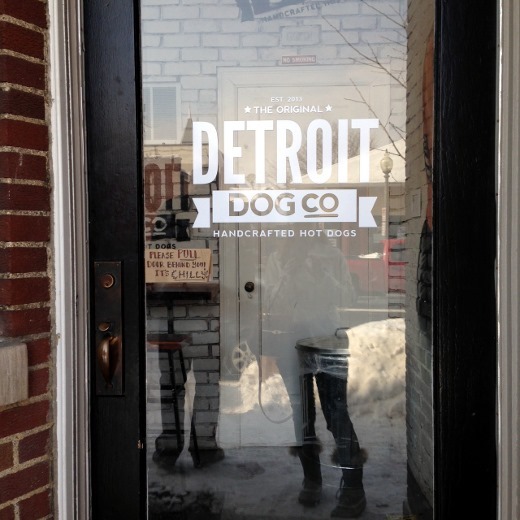 All in all I think Detroit Dog Co. is doing a lot of great things early on in their new Saline location, and look forward to visiting again. It’s a great spot to pop into for a quick bite, while supporting a small local business that sources Michigan products. That place is on our list too! Mmm, hot dogs are my guilty pleasure. Though I am partial to good ol’ Koegel’s!